Royal Queen Seeds only produces feminized cannabis seeds. Royal Queen Seeds is a reliable Dutch cannabis seed supplier where quality is a priority. RQS seeds have already won several awards in the various cannabis cups. 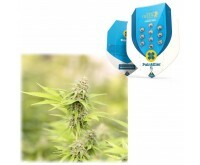 Royal Queen Seeds cannabis seeds are among the most high-quality cannabis seeds available. With more than 20 years of experience, this quickly growing European cannabis grower produces strong cannabis seeds, based on pure, organic genetics. Royal Queen Seeds is a reliable Dutch cannabis seed supplier where quality is priority. For example, RQS only offers feminized seeds. These seeds contain two X chromosomes, and will therefore almost certainly develop into female plants. Royal Queen Seeds uses proven methods to ensure RQS seeds will grow into female plants. Also, all cannabis seeds come from organic mother plants. They are manually harvested, and tested on genetic purity. RQS seeds' quality is additionally guaranteed by testing the seeds on a daily basis, to ensure the best possible germination power. Royal Queen Seeds' mantelpiece is full with awards. Take the Special Queen #1, Royal Dwarf Autoflower and Northern Light, for example. These plants earned the renowned cannabis Cup from Highlife and High Times. The ability to win is a result of the unique genetic line, based on 20 years of professional experience in cultivation. Royal Queen Seeds is among the fastest growing cannabis growers in Europe. At the Dutch-Headshop, we have a large product assortment of feminized, autoflowering and medicinal seeds, for affordable prices and with quick and discreet deliveries.